It's powered by a liquid cooled 286cc single cylinder engine, producing 31bhp at 8,500rpm and maximum torque at 7,500rpm. The engine is basically the same as the CBR300R. 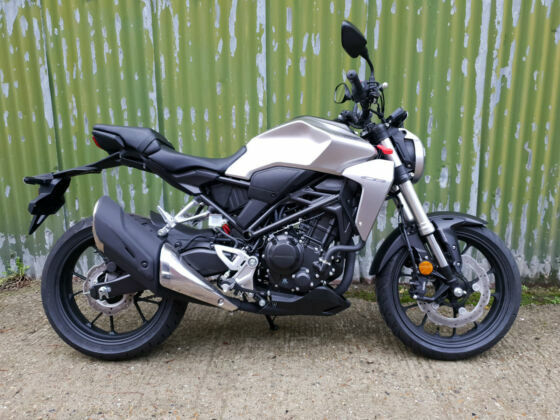 Apart from the engine, pillion seat, exhaust and side panels the bike is basically the same as the smaller CB125R. The ABS system use an IMU but only to give front-back measurements, not the full on cornering ABS you find on the really expensive bikes. Honda's Neo Cafe Racer styling concept is shared with the smaller CB125R and larger CB1000R. The 5 Y-spoke 17" wheels take a Dunlop 110/70 tyre at the front and 150/60 at the rear.